This photo of a major eruption of Steamboat Geyser gives a sense of its power but not its full height! Every time we update the Yellowstone Treasures guidebook, such as for the second printing of the fifth edition in spring 2018, there are numerous changes to the hot springs and geysers that must be reviewed and considered. Not only that, “the number of hot springs in the park has been estimated to be around 10,000. Geysers known to have erupted or erupting now number more than 1,200” (Yellowstone Treasures, page 61). Here are a few of the geyser changes since the cutoff date for the first printing, February 2017. During 2017 Atomizer Geyser (p. 96) noticeably slowed its interval down from twice a day to an average of 20 hours. Page 93 of the first printing says Giant Geyser last erupted on September 28, 2015 (and that was after a five-and-a-half year hiatus, so it was pretty important). But nature has been busy proving the guidebook wrong. Giant erupted on July 7, October 9, and November 3, 2017, so we included the November date as the last eruption. Now the most recent eruption was actually July 24, 2018, and that was the third time in the month of July. 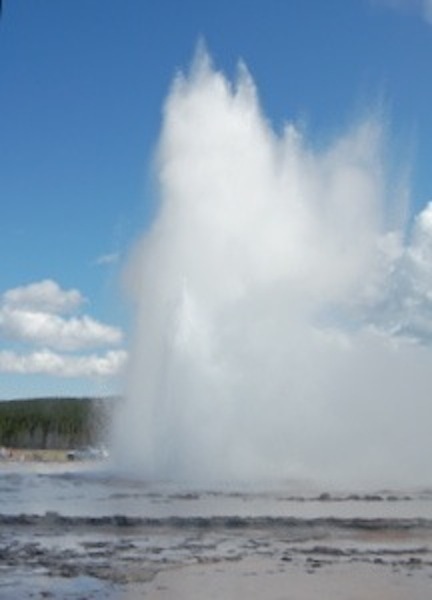 We are fortunate to have a website called GeyserTimes.org, where geyser gazers can log their observations or the notes from a ranger or scientist at the US Geological Survey (USGS) Yellowstone Volcano Observatory. Readings from seismometers, thermometers, and water discharge monitors are used to record eruptions even when nobody is there to witness them. That is how we know that Steamboat Geyser started erupting again on March 15, 2018, too late to get into the second printing. On page 233, it unfortunately still says “After eruptions in 2003 and 2005, Steamboat erupted once each in 2013 and 2014.” Yet as of today there have been 11 more since March 15, with the latest occurring on July 20, 2018! The USGS is keeping a running count of Steamboat’s water eruptions at the Yellowstone Volcano Observatory page. You may have a chance to see the Giant or Steamboat Geysers on your trip to Yellowstone. Stay informed with Yellowstone Treasures, both the book and this website. Photo credit: James St. John, June 4, 2018. Reproduced courtesy of a partial Creative Commons license. More photos and more about the history of Steamboat Geyser is available at on the geologist’s Flickr page for this photo. After a review by our consulting geologist, Jo-Ann Sherwin, we changed the sidebar on page 203, “Why do the mountains look striped?” The layers you can see on some mountainsides are not lava flows per se but deposits of material called tephra from volcanic eruptions. And the eruptions happened closer to 45 million years ago rather than the 50 mya it says in the first printing of Yellowstone Treasures‘s fifth edition and used to say in the nugget on this website. You can read the nugget “How did these mountains get striped?” to see the new explanation. Stay informed with Yellowstone Treasures, both the book and the website. While we recline in the doldrums awaiting the opening of Yellowstone Park’s roads—mostly on April 21st, when the bulk of the plowing should be done and wheeled vehicles can again reach the interior of the park—I will pass along a link about a man who is building a robot to learn what is below Yellowstone Lake and is yet to be discovered and explained by scientists. Elsewhere I learned that project leader David Lovalvo’s crowd sourcing for this project reached its goal of raising $100,000 last year. Granted, this article appeared on the Internet a year ago, but its interest is evergreen. Geoscientists at the U.S. Geological Survey, particularly Lisa Morgan, Wayne Shanks, and Kenneth Pierce, published classic research papers on what they had learned by 2007*. But there is much more of interest lurking in the depths of the lake, and I only hope to live long enough to find out more about it. 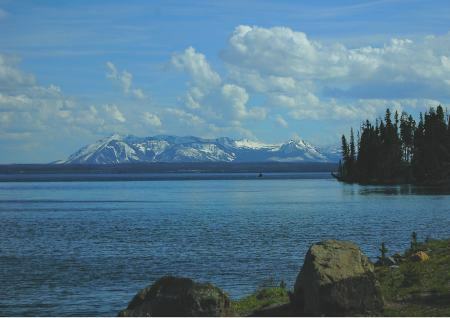 *See the section titled “Yellowstone Lake Studies” in: Integrated Geoscience Studies in the Greater Yellowstone Area: U.S.G.S. Professional Paper 1717. As a forty-four year resident of Rhode Island (until 2005), I was interested to learn today that a company important to the exploration of Yellowstone Lake is now located in next-door Mystic (Connecticut) and written up in The Westerly Sun. I’ve been following research on the wonders of the lake for many years, especially as written up by Lisa Morgan of the U.S. Geological Survey and involving the Global Foundation for Ocean Exploration’s Dave Lovalvo. A quick apology: My long silence as a blog-poster or tweeter has been due to spending all my time promoting my new historical anthology, Through Early Yellowstone, and working on rewrites needed for a super fifth edition of Yellowstone Treasures. Just coming off the deadlines for suggesting changes to the designer’s files for my next book, Through Early Yellowstone, I want to pass on a delightful link from the Yellowstone Insider. On January 27th publisher Kevin Reichard passed on some interesting news published in Jackson Hole News and Guide. Hey! Sharing good stuff is what the Web is for, isn’t it? In a nutshell, some major research bodies, such as the USGS, NOAA, and several universities, are collaborating with the Global Foundation for Ocean Exploration to build a research boat and diving robot that will explore the bottom of Yellowstone Lake. If all goes as planned, starting next summer the robot will take pictures and return samples of what it finds there. 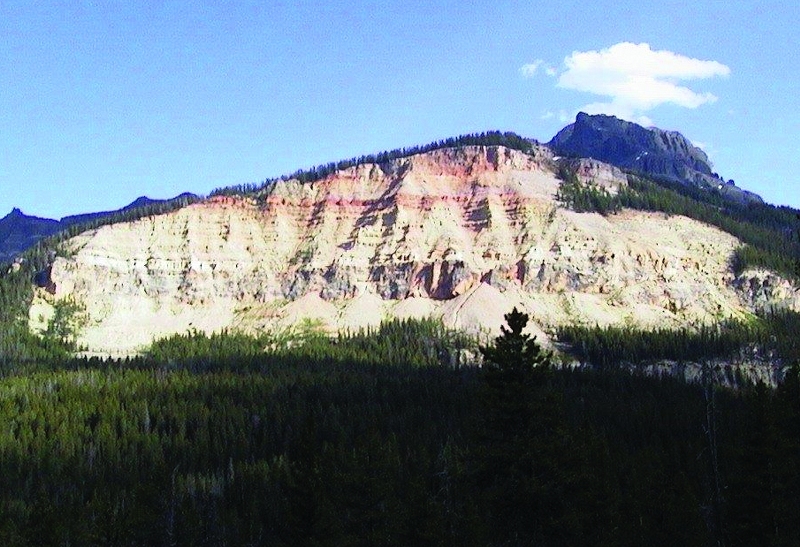 This will follow up on lake bottom research reported by USGS scientist Lisa Morgan and colleagues as part of a series of articles published in 2007: “Integrated Geoscience Studies in the Greater Yellowstone Area,” USGS Professional Paper 1717. [Revised Feb. 27, 2017—Ed. :] The Global Foundation for Ocean Exploration created a fascinating ten-minute video starring microbial ecologist Dr. Reysenbach that does not seem to be available any longer. Although the video does not show us any microbes (seen only under a microscope), it does show some views of the thermal vents on the ocean bottom, teaming with hitherto unknown life. Photo credit: This photo from page 144 of Yellowstone Treasures, fourth edition (2013), was taken by Bruno Giletti. Thanks to the USGS and probably attributable to Jacob Lowenstern, this month we have a new statement from some of the world’s best authorities on the so-called Yellowstone supervolcano. They call it Five Things Most People Get Wrong About the Yellowstone Volcano, going at the problem of media sensationalism from the back side. Lowenstern is Scientist-in-Charge of the Yellowstone Volcano Observatory and studies magma and volcanic phenomena in Yellowstone and all over the world for the United States Geological Survey, Menlo Park, CA. Earthquake data indicates moving magma. All this is well worth absorbing and passing on to any worrywarts you know! And if you want to read more of the “true facts” (what are false facts?) about supervolcanoes, the Volcano Observatory has recently updated another great page by the world’s best authorities on the subject. Generally, I prefer to steer clear of the media flurry every time there’s a large swarm of earthquakes or something else in the news that again brings up the subject of the Yellowstone supervolcano. But I can’t resist passing on this reaction to the recent news about a terrorist in Canada thinking that triggering the magma under Yellowstone would be a great idea. For the best current information on the subject see this USGS page, or take a look at our own nugget about it. Yellowstone Geyser Eruptions: How Do They Work? Knowing that lots of people would like to learn how geysers work, I’ll take a stab at explaining the requirements and the mechanism as simply as possible. What is required to create a geyser and what’s happening when it erupts? 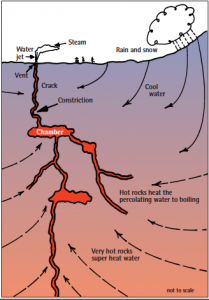 All geysers have four requirements: water, heat, the right kind of rock, and a system of conduits and reservoirs (plumbing) that includes one or more constrictions to keep water and steam from flowing freely to the surface. The water pooled above such constrictions acts like a lid to maintain pressure on water below. Such constrictions differentiate geysers from the much more common hot springs. Although no one has yet been able to see exactly what this plumbing looks like, it must be something like this diagram drawn by my husband Bruno Giletti for Yellowstone Treasures. The countless different shapes the underground plumbing may take must account for the great variety in the patterns and timing of Yellowstone’s geyser eruptions—what I call their personalities. 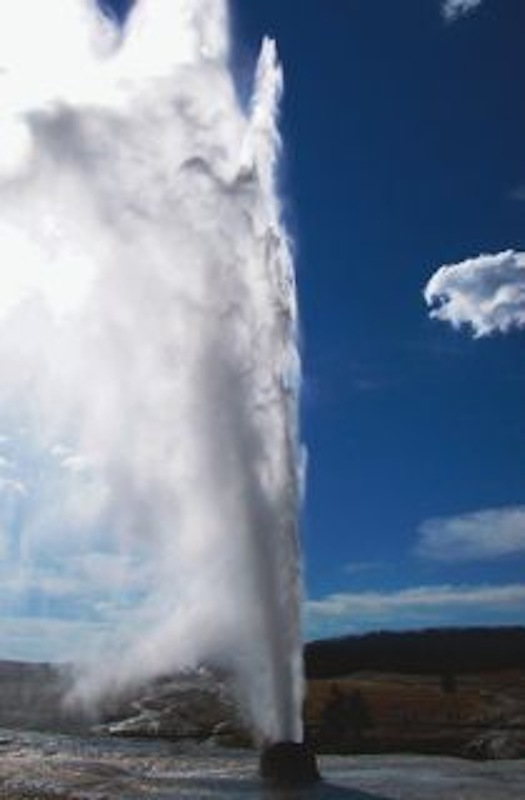 Whether the water comes from the vent in the distinctive cone of Beehive Geyser or from the beautiful geyserite-ringed pool of Great Fountain Geyser, the mechanism is the same. Deep below the geyser’s vent or pool seen at the surface is a kind of rock that is rich in silica. In Yellowstone this rock, called rhyolite, was deposited in huge amounts when the caldera erupted. Silica is the primary element in the hydrous silicon dioxide (technical name for geyserite) that is deposited both along the conduits of the geyser’s water passages and all around its surface vent. Also deep below a geyser are (1) a source of heat—in Yellowstone it is the still extremely hot volcanic rocks more than two miles below the surface—and (2) the water that has seeped into the earth from snowmelt and rain (meteoric water), and voila!—the geyser erupts. As water gradually fills the reservoirs and is heated from below, it becomes superheated and forms steam bubbles, and the water pressure increases. Eventually, the steam pushes some water out of the vent, and steam—which requires something like a thousand times more space than water—is also released. When the pressure is thus sufficiently reduced, the steam in the conduit can blow the water column out of the vent. In many geysers, when the water supply is exhausted, the remaining steam continues for the steam phase of the eruption. I have gleaned some ideas for this post from the sidebar my husband Bruno Giletti, a geochemist, wrote in Yellowstone Treasures (pages 88 and 89) and from T. Scott Bryan, a former ranger and also a geologist and author of books about geysers, including his Geysers: What They Are and How They Work. But as early as the mid 19th century, German scientist Eberhard von Bunsen and others already had it pretty well figured out. 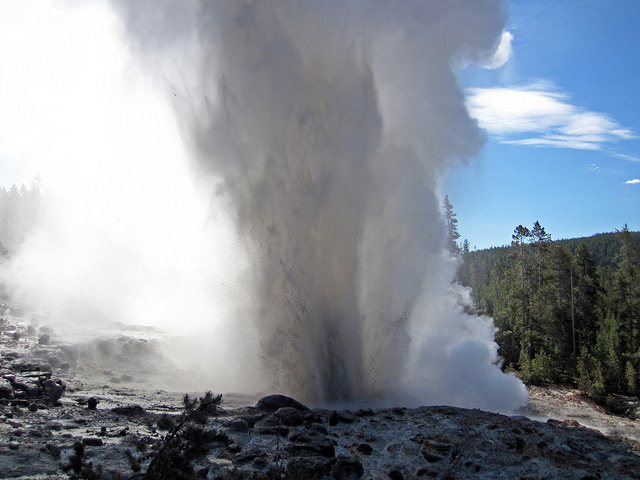 You can find out more about the study of the geyser mechanisms here in my September 2013 post. 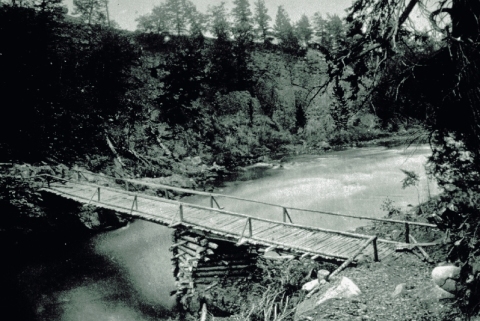 Inside the guidebook Janet shares many anecdotes about the human history of the Yellowstone area, from prospector Jack Baronett who built a wooden toll bridge in 1871 to tourist Hazel Decker who camped in her car for 52 days to observe Steamboat Geyser. 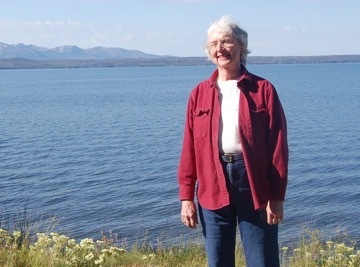 In the road logs she discusses the evidence of prehistoric peoples and the recent discoveries scientists have made at the bottom of Yellowstone Lake using a submersible robot. She compiled a time line of many of the important events in the Yellowstone area and the world in a chapter of Yellowstone Treasures called “Chronology: Yellowstone Since 1800,” which takes readers from the Lewis and Clark expedition up to the present day. But when she and I were creating the first edition of the book in 2001 it became necessary to cut pages from the manuscript and restrict the time line to the most recent couple of hundred years of human history, even though the geological history of the region goes way back before that. Her Geological Time Line, which you can read right here on this website, extends all the way from Earth’s formation 4.6 billion years ago, through the time the Absaroka Range volcanoes formed 53 to 44 million years ago, to the time 12,000 years ago when glaciers last covered Yellowstone. This last episode was the Pinedale Glaciation, evident throughout the lower Lamar Canyon. Credit: Photo courtesy of the U.S. Department of the Interior, National Park Service, Yellowstone National Park. Can’t resist sharing this cute picture of a muskrat in a Yellowstone kettle pond with you. What’s a kettle pond, you may ask? Here’s what the Yellowstone Treasures glossary has to say: “A pond formed in a depression caused by the ground collapsing when a buried block of glacial ice melted. Also called kettle hole.” The melting snow of the caption to this National Park Service photo is just this past winter’s. The hole is much older. You can find out more about how glaciers reshape the landscape on the illustrated pages 311-312 of the “Geological History” chapter in the guidebook.